The Will Read and Sing For Food players will perform a public show to benefit a Hand In Hand Ministries mission trip to Belize coordinated through St. Meinrad Catholic Church and St. Bonifice Catholic Church. The show will be held in Bede Theater at St. Meinrad Archabbey on Sunday, April 12, at 7:00 p.m. EDT (6 p.m. CDT). Will Read and Sing For Food is a unique mix of humor essays and live music that, since 2011, has raised $39,300 for local charities and causes. Special guest essayists Cass Herrington (Evansville public radio’s 88.3 WNIN) and Carol Ubelhor-Troesch (Perry County News, Spencer County Journal-Democrat) will join humor essayist Scott Saalman and musicians Daniel Ross, Debbie Schuetter, Wade Baker, Jessi Fulcher, Megan Gatwood, Kyle Lueken Carley Knapp and Bryan and Jaime Bolin. This June, 15 members of the St. Meinrad Catholic Church and St. Boniface Catholic Church will travel to Belize, Central America, to build a house for a family in need. Admission: $10 minimum donation per person. Proceeds will support the team’s efforts. 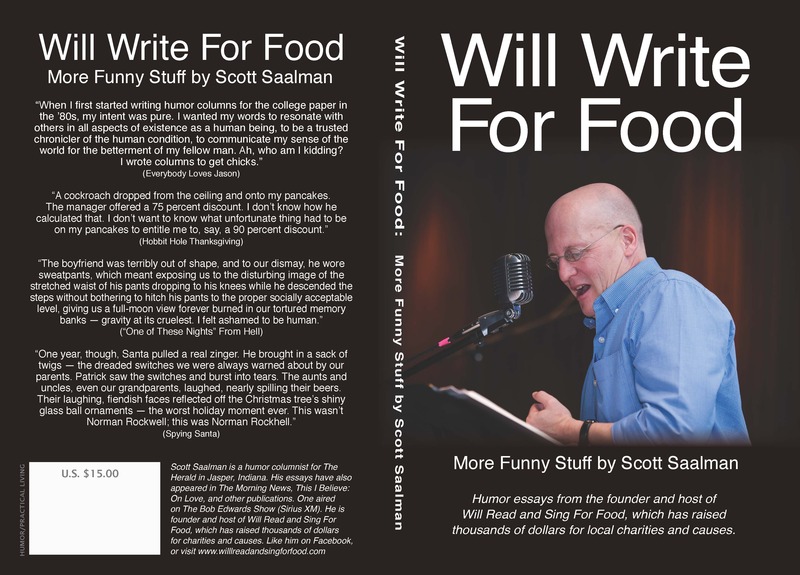 Troesch and Saalman will sign and sell their new books after the show, “Pieces of My Small-Town Heart” and “Will Write For Food,” respectively. The great singer-songwriter Krista Detor performed this at our Will Read and Sing For the Dubois County Humane Society last week. We are better for it.